This past weekend, we finally began to stuff our wedding invitations from Shine Invitations. Our wedding is still 5 months away, but being that it is during a popular holiday weekend and it's 4 1/2 hours away from home we wanted to make sure our guests have enough time to set up hotel accommodations. We went with a simple and elegant invitation in just black and white. Although colors of pink, coral and mint will make appearances at our wedding. We wanted to keep everything simple and felt black and white was the easiest. While most people complain about stuffing their wedding invites - we had fun. Everything was super simple to put together, and Shine Invitations did a great job getting proofs and changes made within minutes. It took less then a week to receive them and I would highly recommend them if you are looking for someone to do your wedding invites, save the dates, or any other stationary for your day. *Note: This post was not sponsored by Shine Invitations and is strictly opinion. Was it me or did this past weekend just fly by? As mentioned yesterday, my Dad came over with his new pup George. Andy and I both went out with our friends, it was nice to see everyone and better yet spend a night away from each other. Saturday night I went out with the girls and he went out with the guys. His ended a little rougher then mine did, but It was nice to have Lincoln to myself and snuggle up with him alone. Sometimes it's just great to have space, and do our own things. I wore this outfit Saturday just relaxing at home and quickly turned it into something to wear out with the girls by adding some heels. Meet George - My Dad's new Bassett Hound. He is absolutely the sweetest little thing in the world. This past Saturday he came over to hang out with Lincoln, Andy and I and it was fun to see how Lincoln reacted to the possibility of having a sibling. Needless to say I don't think we will be adding another pup anytime soon, but it was fun to have a cute little pup to play with all afternoon. Here are a few photos of George. He is only 11 weeks old in these photos. For those that have more then one puppy, how have you introduced a new dog to one you've had for quite some time? I decided to make some Thin Mint Cupcakes - which ended up being extremely delicious and a huge hit at our household. To save on time I used pre-made cake mix and frosting that I already had but any personal favorite recipes you might have for either would work just as well. 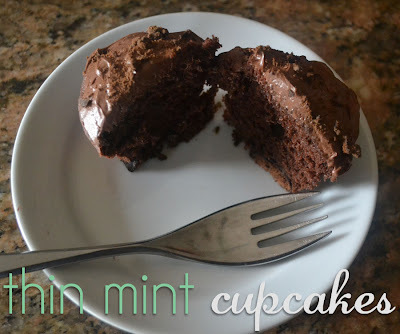 First line your cupcake pan with cupcake cups and then place one Thin Mint at the bottom of each cupcake. Then mix together the cake mix, eggs, water, and oil in a large bowl. After all the ingredients are mixed, fill each cupcake liner to the top and placed in the oven at 350 degrees for 17 minutes or so or until a toothpick comes out clean. Next let the cupcakes cool for 20 minutes or so. I personally toss them into the fridge or freezer to speed up the process. Then mix the can of whipped frosting with the peppermint oil. I choose to go a little light on the peppermint oil so if you love mint I suggest adding to taste. At first I was going to garnish each cupcake with a 1/4 of a cookie but when they didn't turn out so well I started turning them into crumbs. Once cool begin icing cupcakes with chocolate whipped frosting garnishing with cookie crumbs. Enjoy! *Note I only wanted to make 12 cupcakes - so they were larger then normal, but if you would like to make more only fill each cup halfway - you should be able to get 20-24. After experiencing some amazing weather last week in Florida and some sort of unexpected snow storm last night - I'm so ready for spring but in order for spring to arrive I'm gearing up from some not so fun rainy weather. But hey, April showers bring May flowers right? I'm slightly obsessed with Hunter Boots my favorite in Black and this North Face Rain Coat is super cute- not like those yellow rain coats our parents made us wear. The Kate Spade umbrella makes for a fun and is playful, making rainy days not so bad. So if you decide to crawl out of bed and brave the storm, what is your go to rain wear? The countdown has begun before Andy and I move into our new place. I can't wait to redecorate and create our first real place together - we have lived together for two years but my first apartment out of college was mine for the first year so when he moved in it really wasn't his space. I have always been in love with black and white everything so I love to pick one pop of color and mix and match with a variety of black and white prints. I love the black and white stripe with a different print in the rug so I will definitely be looking to get a similar ensemble for our new digs. No room is complete without a nice set of candles to lighten the mood and help give off a fresh scent, and no coffee table is complete with out some picture worthy reads surely to entertain your guests. When it comes to the walls - I've traditionally always painted but to be honest we'll only be in our new apartment for two years at the most and after our last repaint I can do without until we move to our first house. Oh well - expect plenty of new apartment inspirations and I can't wait to show off our new digs in early April. Congratulations Cali W on winning this lovely prize pack. Please look for an e-mail later today to confirm shipping. If you didn't win, no worries make sure to stop by again soon for more prize giveaways! Something new for our new apartment. Spring break is currently in action for my alma mater- so while I like all my sorority sisters pictures on Facebook as they party it up on the beach, I couldn't help but take a glance at some of this season's cutest bikini's. I'm really drawn to anything polka dots as is, but i'm also loving the chevron patterns, and a nice anchor never goes out of style. What are your favorite bikini picks for this season? Is there a certain color or print your loving? With recent news that Andy and I are moving back into our own apartment. I'm ready to start purging items we've collected since living with Mom and Dad. One of which being some of the samples I've received as a subscriber to Birch Box. I been a subscriber for about 3 months now, and at first was extremely excited. I am a beauty junkie and absolutely love new products. The only issue is I already own so many, I wasn't really trying them so I gave up my subscription and now have some samples to to share with you I also tossed in a personal favorite Essie Nail Color - don't worry it's brand new! To Enter to Win - it is extremely easy - just comment on this post and make sure you have your e-mail address. One entry per person unless you do the "bonus" below. Giveaway closes on Sunday, March 10th at Midnight with the winner announced on Monday March, 11th so make sure to check back if it is you!